Nike’s fifth edition in the in Mercurial Superfly series is their best yet. 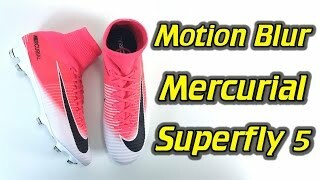 Boasting the same technology as the Cristiano Ronaldo’s CR7 boots the newest versions of the Superfly V combine the latest boot tech to create the fastest football boot on the market. The seamless one piece upper combines Nike’s Flyknit and Flywire technology that gives you unrivaled lockdown. The All Conditions Control (ACC) added to the boot ensures water does not seek through the Flyknit material. The boots protection come from the lightweight NikeSkin layer, whilst the 3D Flyknit Speed ribs create a more enhanced touch on the ball. 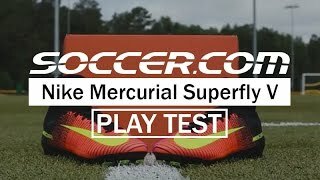 Nikes improvements to the Mercurial Superfly V Soleplates reduced the weight by 40% on models. This is due to the hollow soleplate which shapes to the sole of your foot. This boot is made for the speedsters in the team. The player who enjoys sprinting past the opponents and dribbling at pace. 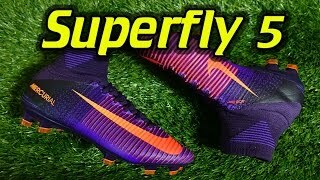 If you want to increase your acceleration and speed on the pitch, then the Superfly is definitely an option for you. 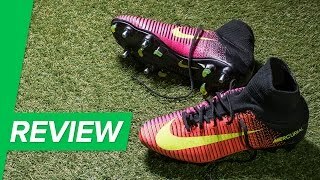 Nike’s most advanced football boot ever, years of research and testing have created a boot that improves players performance on the pitch, whilst also decreases the weight and increases the strength on the boot. 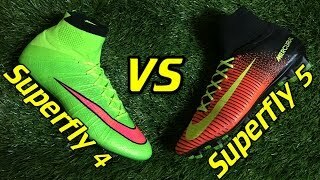 Two of the main technologies used to improve the speed of this boot are the Flyknit material and the uppers integrated Speed Rib. These cables produce friction on the ball to improve a players touch, helping to give a natural feel whilst shooting, dribbling or passing at speed. It also helps to lock down the foot down towards the insole as the cables transcend through the laces and outsole, enabling the player to perform turns at speed and increasing the response of the boot. The flexible one-piece Flyknit upper ensure the boot feels like part of the foot. Providing comfort and fit and improved control as due to the removal of the tongue. Touch is improved even further by including Nike’s All Condition Control (ACC) tech and the mesh NikeSkin provides a snug fit whilst also allowing the foot to breathe. The ankle nests in the Nike Dynamic Fit Collar, which mimics a support sock like sensation. Once on foot, this boot feels like part of the leg and reduces the distraction of wearing a football boot. 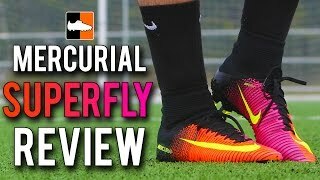 Perhaps the most innovative area of the Nike Mercurial Superfly V is the anatomically correct outsole. In the past outsole were flat and generalised, however, Nike research team have created an outsole plate that follows the natural curve of the foot. This extensive research process lead to a single layer nylon chassis, which was 40% lighter than the previous Superfly, whilst the Split- function at the front of the boot improve traction on the pitch and a players flexibility in the boot. Elite football is all about speed, no matter what position you play in, acceleration off the mark is key to getting the edge over your opponent. Players must be able to change direction, which involves stopping and exploding off the stop as quick as possible. Therefore Nike designed a stud configuration to cater to both acceleration and deceleration. Using computer research and testing, Nike established the parts of the foot which had the highest flow of power and the foots pressure point areas when sprinting. They used this info to create a new stud pattern, with angled studs which claw back the turf for added acceleration or deceleration when changing direction.